The Board of Directors at Lindenwood University today announced the hiring of Michael D. Shonrock, PhD, as Lindenwood’s 22nd president. Lindenwood University received a significant seven-figure foundational gift to name the Robert W. Plaster School of Business and Entrepreneurship and to serve as a lead gift in the construction of a new $21 million Library and Academic Resources Center on its St. Charles Campus. One of two teams from Lindenwood University placed fourth in a field of 36 teams in the 2015 Missouri Collegiate Mathematics Competition, held recently at Missouri University of Science and Technology in Rolla, Mo. 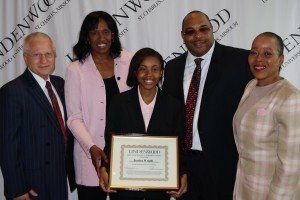 Lindenwood University administrators, Olympian Jackie Joyner-Kersee, and representatives from the R. Whittington Foundation presented local high school student Jessica Wright with a full four-year scholarship on April 7 at the Lindenwood House on the St. Charles campus. 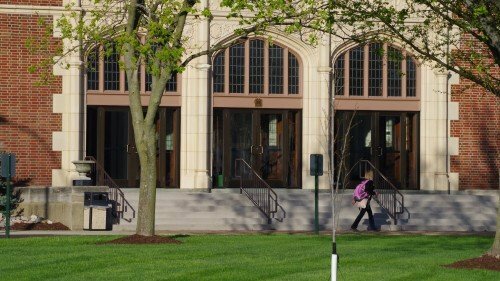 The collaboration is part of Lindenwood’s ongoing effort to make a four-year college education accessible and affordable for St. Louis-area students. Lindenwood University has received from Sigma-Aldrich Corporation $576,000 worth of equipment and consumable supplies that will be used by its School of Sciences, primarily in biological sciences and chemistry. Lindenwood University’s Historic Daniel Boone Home & Heritage Center has announced a significant grant from the Robert J. Trulaske, Jr. Family Foundation. This gift will support the preservation of several buildings on the Boone Home site in Defiance, Mo. The preservation projects includes roofing, painting, and building repair and restoration. In addition, the grant will support the installation of wayside exhibitions (educational outdoor signs) throughout the site. The Grammy Award-winning St. Louis Symphony will make its debut performance at the J. Scheidegger Center for the Arts at 2 p.m. on Sunday, April 12, with Music Director David Robertson leading a program of familiar classical favorites. Three students from Lindenwood University’s Delta Epsilon Chi (DECA) chapter placed in the top portion of their respective categories during the business organization’s state competition in February in Jefferson City, Mo. DECA is a not-for-profit extracurricular organization designed to prepare students for careers in marketing, management, and entrepreneurship with more than 215,000 members in the United States and around the world. The Lindenwood University Shotgun Sports Team has received a $21,879 grant from the MidwayUSA Foundation, Inc. through the Foundation’s Team Endowment Account Program. Members of the Lindenwood University women’s basketball team will trade jerseys for designer fashions as part of the upcoming Hoops ‘N’ Heels fashion show. The inaugural fundraising event benefiting the team will take place at 7 p.m. on Thursday, March 26, in the auditorium of the Lindenwood University Cultural Center, 400 North Kingshighway, St. Charles, Mo., 63301.